UVB, The Way it Was Meant To Be! German Designed and Manufactured for The Most Precise Application of UVB = Perfection! THE UV SENSOR: OPTIMAL AND REPLICABLE UV SESSION, EVERY TIME! Fact: All UV Lamps decrease in strength every time you turn them on. Question: How then can you make sure you are providing the optimal amount of UV Irradiation? Answer: The Aqua Pro UV Sensor...The Perfect UVB Session, Every Time! 1. The Perfect UV Exposure: Since all UV lamps decrease in strength every time you use them, this means that every time you use that lamp, the UV Session is becoming less effective and less effective...unless of course you could compensate for that decreased lamp strength by increasing the exposure time, but how much should you increase the exposure time? The Aqua Pro UV Sensor tells you! The Aqua Pro UVB System is constantly measuring the UV Lamp Strength, and based upon that information the Aqua Pro knows the precise speed at which your sample should go through the UV Irradiation Field. It then provides you, the operator, with the perfect speed to draw the sample through the UV machine on the front panel display. 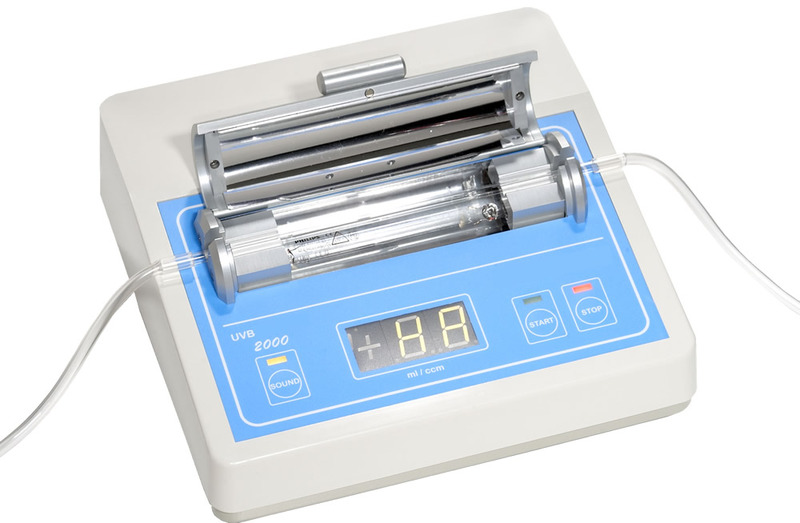 This ensures the procedure is performed perfectly, each and every time regardless of the strength of the UV Lamp. No other UV Machine on the market today has a UV sensor, and without that sensor you are subjecting your samples to simply 'random' levels of UV Exposure. The Aqua Pro guides you to perfect exposure, every time. 2. Is Your UV Lamp Strong Enough to Provide Efficacy? You Need to be Sure! : Your UV Lamp will produce visible 'light' long after that light has dropped below the threshold of intensity suitable for UVB. Oh oh, this means that just because your UV Lamp illuminates, that does not mean it is of suitable strength to provide efficacy. The problem is that there is no way to predict when this will happen...300 hours? 350 hours? 400 hours? If you use the UV Lamp until it 'burns out' it is likely the last several hundred UV Sessions have not provided any benefit. Problem Solved! The Aqua Pro will measure the UV Lamp irradiation intensity before each session, and if it finds that the lamp is no longer suitable to be used for UVB it will notify you that you need to change the lamp before continuing. Only One UV Lamp Required! Not 2, not 4, not 5! The "Rounded" shape of the exposure chamber of the Aqua Pro is no accident. This "Focus Chamber" is precision shaped to ensure that each and every ray of UV Irradiation is "Focused" on the Quartz UV Cuvette that sits inside the chamber. This means that no matter which direction the UV Ray was headed when it was emitted from the UV Lamp (up, down, left, right...) it will 'bounce' off the precisely shaped walls of the Focus Chamber and focus on the UV Cuvette that contains your sample. This means not a single ray of UV is wasted; 100% Efficiency. Other UV Devices with no focus chamber or simply random mirrors have 4, 5, or even 6 UV Lamps as they attempt to expose the sample from all sides. All they usually achieve is: Heat. All of these lamps that follow a seemingly never ending and completely unproven 'more is better' design, simply create a tremendous amount of heat that could damage your sample. How do the manufacturers compensate for these wildly high temperatures that could damage your sample? They tell you to dilute your sample with saline to try to prevent the damage that results in clumping, coagulation, and lysis of fragile samples. The Germans discovered long ago the precise UV Irradiation exposure strength and timing, that guarantees you the best UVB results. The Aqua Pro UV Instrument ensures that you can duplicate their success, for each and every UV Session. Start using UVB the Right Way, the Proven Way with German Designed, Engineered, and German built Aqua Pro I or II Device. Certified and Approved to German Safety and Quality Standards. No one knows UVB like the Germans. In stock and ready to ship across North America. Start Today. Start Right. Start Now. Aqua Pro UV Device I and II "Specifications"
Aqua pro UV System Specifications. Call Longevity Resources Inc. if you need more information! Fully inspected and rigorously laboratory inspected by European Inspectors and granted CE Approval. When a CE Approval is provided by a European company, this means the product is fully inspected and the factory is also fully inspected for quality controls. On a European product, CE Approval is your proof of Quality. All UV Lamps decrease in strength every time you use them. The Aqua Pro 'On Board" UV Sensor precisely measures the strength of the UV Lamp and then provides YOU with the optimal rate of speed to draw the sample through the UV field. 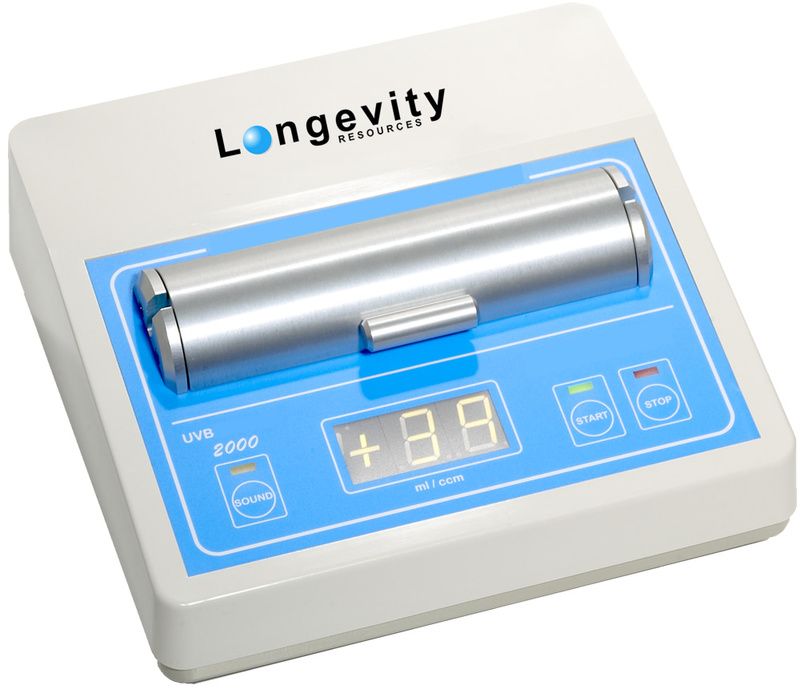 You perform the perfect UV Sessions every time regardless of the UV Lamp strength. 90 - 240 Volts Volt AC 60 or 50 Hz no converter required. 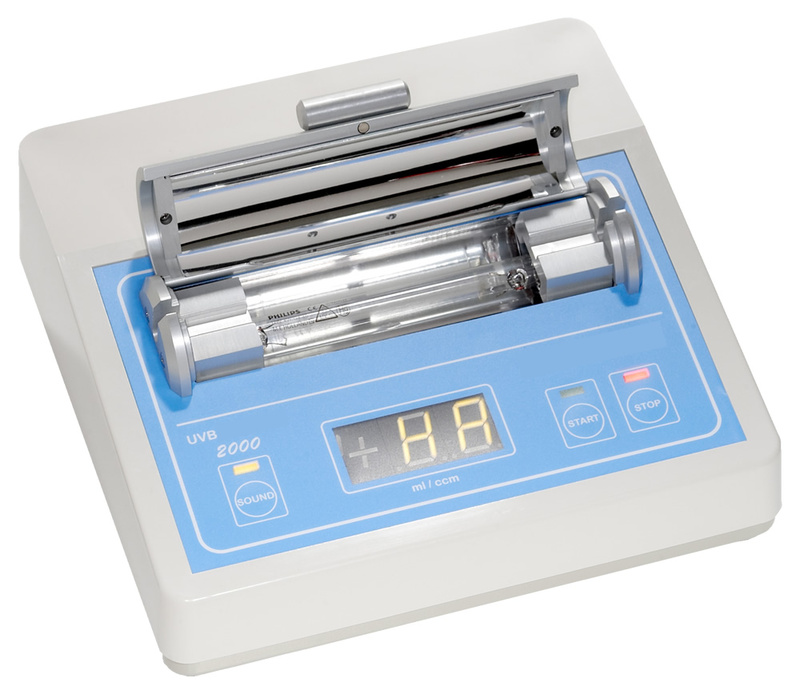 Focus Chamber focuses every single UV Ray on the sample ensuring only 1 UV Lamp is required (no need for 4 or 5!). One Lamp = no heat and therefore no need to dilute the sample with saline, and absolutely perfect treatment of that sample (no heat damage because there's no heat!). While other companies will place unnecessary plastic pieces in the cuvettes (remember, plastic is destroyed by UV irradiation), Longevity requires no plastic devices in our cuvettes. we use only plastic free, pure, contaminant free cuvettes available starting at only $8.50 USD. 3 Year Parts and Labor Warranty. 30 Day Money Back Return Policy. (See details when purchasing as restocking fees may apply). After more than 20 years in business, Longevity staff have earned a reputation for providing Legendary Customer Support. Friendly staff are always available to help you with your questions about using the Aqua Pro UV Systems, no charge, no expiry date...just smiles!